(Newser) – A small copper awl found in a woman's ancient grave in Israel is rewriting history. 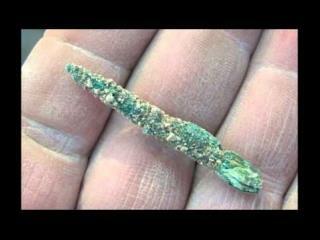 It's the oldest metal object ever found in the Middle East, and was probably owned by the apparently important 40-year-old woman buried with it in an extravagant Tel Tsaf grave, LiveScience reports. The awl's date has pushed back metal use in the region centuries earlier than thought, to about 5100 BC. The copper it's made of was likely brought in from 620 miles away, adds Sci-News, suggesting locals imported metal objects first before starting to create them. Archaeologists had previously estimated the region's metal use started around 4500 BC thanks to some copper artifacts and gold rings found in the southern Levant. I have a question for all of the religious minded commenting. In which religion did the god(s) write the bibles? Now, some will say the 10 commandments were written by god and delivered to man by a man that spent months, if not years, on a mountain waiting for them. Others claim that the bible was written on gold plates by god. All religions have similar stories for how theirs got started. What it all boils down to, is that none of the gods bibles have managed to come to man from god(s) as all of the 'original' texts are missing or otherwise destroyed. So then man was trusted to explain what was in the bibles. And the only way anyone knows the bibles is that man has written it for them. BTW: Religions vary according to sects as man says. That, one god, thing never seemed to catch on. So basically the religious base their life and values on something men have told them as their omnipotent gods could not create a bible that would last for millennia. That's faith for you; it makes absolutely no sense but you accept it anyway. Common sense is in front of us all at every moment but very few choose to use it.